I'm very happy to be here this evening with you, and I'm very honored that the Sovereignty Commission would invite me to come and speak this evening. I also want to express my gratitude to Bumpy Kanahele and the members of the Ohana Council who have been serving as my sponsors here, for the week that I'm here. 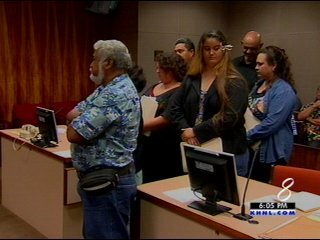 Now as I understand it the Sovereignty Commission is looking into models, examples, of where the native people of Hawai'i can go in light of the state legislation that has been adopted and also now in light of the recent federal statute that has just been signed into law by President Clinton. And I've been asked to come here tonight to discuss one particular model, for the future, for Native Hawaiian people to consider. Understand I was not invited here to go through all the possibilities that you might have. I'm happy to comment on some of them if you have questions and give you my opinion about them. And understand its not for me to tell Native Hawaiian people what to do. You have to decide for yourselves. But, one thing I can do is to describe a particular vision of the future; how you might go about achieving it; what would be the consequences; what would be the basis of authority for doing it; particularly in light of public law 103-150 signed by President Clinton. When I read the public law for the first time, the first thought that occurred to me is that now the United States government, after one hundred years, has finally and officially conceded, as a matter of United States law, that Native Hawaiian people have the right to restore the independent nation state that you had in 1893 when the United States government came and destroyed it. And also then that as a matter of international law the Native Hawaiian people have the right to go out now and certainly proclaim the restoration of that state. I'm not talking about the State of Hawai'i as part of the United States of America. Rather I am talking about an independent state under international law, and ultimately someday a member of the United Nations organization and other international organizations. Now here there is a recent example that had been pursued by the Palestinian people who in 1988 decided of their own accord to proclaim their own state, and this was a decision taken by the Palestinian people as a whole. It was subject to a majority vote because there was not unanimous consent, but even those who opposed agreed to be bound by a majority vote. In 1988 they unilaterally proclaimed their own state, in a declaration of independence. This unilateral declaration of independence eventually led to the Palestinian state being recognized today by one hundred twenty-five (125) nation states in the world. Now, you don't read about that much here in the United States, because the United States government is one of the few governments in the world to oppose the Palestinian state. But almost all of Latin America, Africa, and Asia recognize the existence of the state of Palestine. Again, these are indigenous people, like Native Hawaiians, striving for their right of self-determination. And indeed the Palestinians have the requisite votes to be admitted to the United Nations organization as a sovereign independent nation state, and yet it is the threat of a United States veto that had prevented the admission of the state into the United Nations organization. But even then this has not prevented the vast majority of the states in the world from recognizing the existence of their state. And even most of Europe would accord them formal de jure diplomatic recognition if not for pressure brought to bear by the United States government, and so many of the European states, which are the last holdouts, are today according them de facto recognition as an independent state - that is they are treating them as if they are an independent state without formally coming out and announcing it. So this is one model to consider that I'll discuss. Not that the plight of the Palestinians are on all fours with Native Hawaiians, but there too you have a situation of massive violations of fundamental human rights and people living under a regime of military occupation. In their case for the last forty-five years, in your case for the last 100 years. So I'll be discussing some of the parallels with that process, and what could be the Native Hawaiian process in the event that you were to decide to move in that direction. And understand I'm not here to survey all of the possibilities you might have. I'm prepared to comment on them. There are other things you could consider - autonomy; returning to Article 73 status at the United Nations; semi-sovereignty. There are various different types of status. But again from my perspective, this is the route that other people in your situation have chosen to go, and there is ample authority and precedent under international law for the Native Hawaiians to decide to move in that direction. "The purposes of the United Nations are to develop friendly relations among nations based on respect for the principle of equal rights and self-determination of peoples, and to take other appropriate measures to strengthen universal peace." Now, if you were to do this, or consider doing this, there are four characteristics, requirements, for the creation of an independent state. I submit - as I'll point out as I go through the analysis - that the Native Hawaiian people, Kanaka Maoli, have all the requirements you need to go ahead and do this if this is your choice, this is your decision. First, we need a fixed territory, and clearly we have the Hawaiian Archipelago. Second, a population, a distinguishable population of people, the Native Hawaiians, those who would trace their ancestry back before the appearance of Europeans on these lands. Third, a government, and here you have your communal structures, the Kupunas - Kekune Blaisdell, my friend - and the Kupuna Council, that you've traditionally had. You don't need a government along the lines of the federal government of the United States or the State of Hawai'i to have a government. Rather what you need is a way to organize your people to govern your relations among each other, and clearly you have that. And fourth, the capacity to enter into international relations, to deal with other states, and to keep your commitments. As I understand it, there are already states in the Western Pacific region that support the Native Hawaiian people and probably would be prepared to give you diplomatic recognition as an independent state if this is your desire. And I also suspect, like the Palestinians, there would be a large number of states - certainly in the third world, that have come out of a colonial situation, in Latin America, Africa, and Asia - that would also be prepared to recognize you as an independent state, and enter into diplomatic relations with you. Whether you would someday be allowed into the United Nations of course would depend on the U.S. veto, but even there, the U.S. veto does not go on forever. Eventually they lifted the veto on the admission of Vietnam to the United Nations, despite the enormous hostility towards the people of Vietnam, and Vietnam became a member nation of the United Nations organization. So that being said as preliminary, introductory remarks, I'd like to go through the public law on a line by line basis and give you my analysis of it. And indeed I would encourage all of you, as Native Hawaiians, to study this. It makes it very clear what happened to you. And this is now officially recognized as a matter of United States domestic law. You should be able to take this law any time you're in court and haul it out and show it to the judge and the jury, and say, "This is the law; this is what has happened to me and my people, and I am basing my conduct, whatever I am doing, on the basis of this law. It cannot be denied any more." 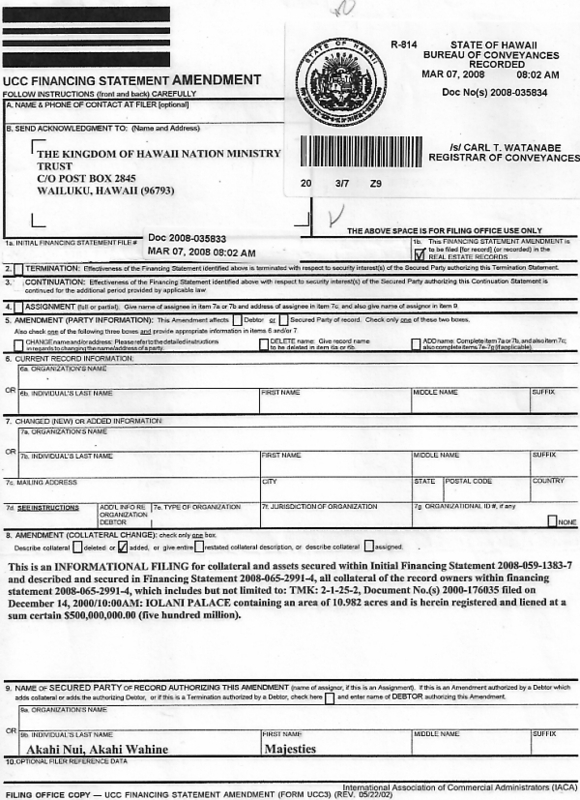 As a litigator before the International Court of Justice, I would be able to take this law to the World Court and say, "The United States government has now officially conceded that it illegally invaded and occupied the Kingdom of Hawai'i, and for this reason the native people of Hawai'i would be entitled to a restoration of their independent status as a sovereign nation state, to go back to what they were before the U.S. invasion, to undo the damage that had been done." Now this is styled as an apology, and one might say: Yes, an apology is certainly here and it's long overdue. But it's also not enough. When a government commits a severe violation of international law, as happened here, they just don't apologize and walk away. Damages are required, reparations, and - in extraordinary circumstances - restitution, that is to return the situation to what it was before the violation. Especially when you have a treaty violation and in the case of the Kingdom of Hawai'i, there were three treaties on point, in law, with the United States government that were violated by means of the invasion. This violated international law at the time, the basic principle - pacta sunt servanda - treaties must be obeyed. It even violated the terms of the United States Constitution at that time. Treaties were the "supreme law of the land," and the invasion and annexation of Hawai'i in violation of those treaties not only violated international law, but the United States Constitution itself. So an apology is certainly a start, but we really now have to deal with the consequences. What are the implications of this apology, of this law? And that is the topic of what I'm speaking here tonight, what might be some of the implications of this law. And indeed, the implications, I submit, are what you, the Hawaiian people, are going to make of this. It is for you to decide the implications, not the Congress, not the State of Hawai'i government, but the Hawaiian people, pursuant to your right of self-determination. What will be the implications of this, as you see it? What do you want? It's clear then, they admitted in the law that they overthrew the Kingdom of Hawai'i. A clearly illegal act, under the standards of international law in existence at that time, no question or doubt about it. In a meeting this morning, this afternoon, I was speaking with Judge Nakea on behalf of the Graces, and he said: Well, yes, but in the United States law, the United States government has always been able to extinguish the right of native peoples, and the Supreme Court has seen nothing wrong with that. I said: Well, that might be the case with respect to Native Americans living in the United States, but here in Hawai'i you're in a very different situation. You had these three treaties, one of which was a treaty of friendship, and commerce and navigation, that established good relations between two sovereign states, and they violated that, too. And this issue, a treaty of this nature, came up most recently in the World Court in the Nicaragua case, when the World Court condemned the United States government for violating a treaty of friendship, commerce, and navigation, for mining the harbors in Nicaragua. And certainly the World Court can do the same thing for overthrowing a monarch, and overthrowing and destroying an entire sovereign nation state. And here then you have the Congress of the United States of America admitting that in one of its own laws. And that's very clear, this admission, what we lawyers call an "admission against interest." They have admitted what they did, and they have then opened this Pandora's Box. How should this be remedied? And again the one point to keep in mind here is that it is now for the Hawaiian people to decide the appropriate remedy, not the Congress. They're the criminals. They've admitted what they've done now, for the last one hundred years - and that the American presence, then, in Hawai'i, for the last hundred years, has been nothing more than an illegal, colonial, military occupation regime. The next sentence goes on - and here remember it's important when reading through this act, the so-called whereas clauses: these are official findings of fact and law, by the Congress of the United States. These findings bind all state and federal courts here in Hawai'i. And again I was pointing this out this afternoon to Judge Nakea with respect to the case of Mike and Sandra Grace, that the court and judges are bound by these findings of fact. They can no longer be contested or denied. They're stuck with them. Pursuant to the conspiracy naval representatives called armed forces of U.S.
Vowels can be long or short. Long vowels are usually written with a macron (a, e, i, o, u), but if no macron is available, a circumflex (â, ê, î, ô, û) can be used instead. The letter W is pronounced [w] or [v] after a, [v] after i or e and [w] after o or u.
Hanau ku'oko'a 'ia na kanaka apau loa, a ua kau like ka hanohano a me na pono kivila ma luna o kakou pakahi. Ua ku'u mai ka no'ono'o pono a me ka 'ike pono ma luna o kakou, no laila, e aloha kakou kekahi i kekahi. Unsurpassed knowledge, palena 'ole ka 'ike. "Whereas, prior to the arrival of the first Europeans in 1778, the Native Hawaiian people lived in a highly organized, self-sufficient, subsistent social system, based on communal land tenure, with a sophisticated language, culture, and religion." That concedes that Native Hawaiians at that time and as of today still have the one requirement for an international state, which I mentioned, a government. You had a means to govern yourselves as a people. Congress has effectively conceded it right there. It still is in existence today. And this is a type, a system of government that is historically separate and apart from the State of Hawai'i or the United States federal government. It is still there, it still works today. I've seen it since I arrived here on Sunday with my visits with Bumpy and the Ohana Council - the people of Hawai'i providing shelter, food, housing, education, dispute settlement procedures and mechanisms. The types of things that you did a hundred years ago, before the U.S. invasion, to some extent you're still doing today, and it would simply be a question of expanding those types of functions that you provide to your own people. In the case of Palestine, this is building the state from the ground up, where the Palestinian people rejected participation, acquiescence, collaboration, with Israeli military occupation forces, and proceeded to provide social services to their own people: health, education, judges, dispute settlement, whatever. That is building the state from the ground up. That's how you build a state. No one is going to give it to you. I doubt very seriously that the U.S. Congress tomorrow is just going to pass a statute and give you a state and say, "Here." Rather you go out and say: We're creating our state. There it is, and we ask you to recognize the state, and then the consequences from there. Whereas, a unified monarchical government of the Hawaiian Islands was established in 1810 under Kamehameha I, the first King of Hawai'i." Again, Congress admitted, you had a government. You had a state. It was there. It was viable and functioning. It was internationally active. This was not a situation that the U.S. government maintains with respect to Native Americans. Now here they're wrong, too. They maintain that Native Americans did not have a states type structure that they had to recognize, because it was somewhat different from the structures of government that Europeans brought to the North American continent. We know they're wrong. The Native Americans did have a governing structure. It's just the Europeans didn't want to recognize it, and wanted to steal the land. But putting that aside, you're in a very different situation here from Native Americans. Now Congress has conceded what they will not concede for the Native Americans - that you had a state, that it was a state just like any other state in existence at that time - just like the United States of America - and was entitled to as much respect and dignity. And Congress has now conceded this point. That's why when I read in the newspaper on Monday about this visit by the Secretary of the Interior Babbitt, and his question, "Should Native Hawaiians become treated by the federal government like the Native Americans?" And my response to reading that is, "Why would you want to do that?" Those of you who had a chance to view the tape of the San Francisco Tribunal - and I encourage those who haven't seen it to watch it, Kekuni has it, Kekuni participated - you'll see that Native Americans are up against genocide and extermination. That's the policy of the federal government, with respect to Native Americans. So I don't understand why Native Hawaiians would want to buy into a system and be treated in the system in a way that ultimately would lead to your extermination. And that's certainly the way large numbers of Native Americans see it. That was the purpose of the San Francisco Tribunal, and then I'd encourage you, if you haven't seen that tape, have a look at that tape. So whatever you do, I would certainly caution you against trying to seek the same type of treatment that the federal government has doled out to the Native Americans, because we know where that will lead. Moreover, on the basis of this statute, you're entitled to a lot more than what they give the Native Americans. And that's not to say that, in my opinion, the Native Americans aren't also entitled to establishing themselves as independent nations, if that is their desire. But the difference here is that your right to do this, the predicate to do this, has now been recognized by the United States Congress itself. Whereas the Congress has never recognized this for Native Americans, and I doubt the U.S. Congress ever will, because if they did that, they would eliminate the whole basis of pseudo-legitimacy upon which the United States Congress rests, land, title, and everything else. And I doubt very seriously that they'll want to do that. "From 1826 to 1893, the United States recognized the independence of the Kingdom of Hawai'i, extended full and complete diplomatic recognition to the Hawaiian Government, entered into treaties and conventions to govern commerce and navigation"
- and friendship. Now they didn't put the word "friendship" in there, they wanted to delete it, but the treaty was friendship, commerce, and navigation. So here they're admitting that the invasion, overthrow, occupation, annexation, starting in 1893, on up, violated all these treaties, violated basic norms of international law, even in existence at that time, and that was a pretty bad time, one must admit. You had states going to war, people killing each other, the strong doing what they will, the weak suffering what they must, pretty much like today in the New World Order. But again, here, the United States Congress taking the position: Yes, this behavior was illegal under international law even in accordance with the minimal standards at that time. And again this distinguishes the case of the Native Hawaiians from the Native Americans, where they have yet to admit that there was anything wrong under international law with the way they treated the Native Americans, and if you read all the supreme court cases, they say: Well, this is just the right of conquest, and those were the rules in existence at that time. But what they're saying here is: No, this was not just a question of right of conquest, but treaty violations. They were violated. It violated international law. It even violated the terms of the United States Constitution at the time where treaties were the "supreme law of the land." So again, legally you're in a much different, much better situation than Native Americans. The section on the Congregational Church - well, as I understand it, there is an attempt being made to have reconciliation. I'll skip over that one. "On January 14, 1893, John L. Stevens, the U.S. Minister, conspired with a small group of non-Hawaiian residents of the Kingdom of Hawai'i, including citizens of the United States, to overthrow the indigenous and lawful government ." So again, they concede that the government of the Kingdom of Hawai'i was the lawful government at that time, and that an official agent of the United States government conspired to overthrow the government of Hawai'i. So the United States government is bound by the actions of its agent, of its Minister. And so they can't say, "He did it, and later on we condemned what he did." You know the President did shed a crocodile tear or two over what he did, did he not, right? There was a statement, whatever. That's not enough. Of course it isn't. If the Minister did it, it's just the same as the President doing it. There's no difference. The President is bound by the actions of his Minister. And the United States government was bound by the actions of the Minister. So it was the United States government that conspired to overthrow the lawful government of the Kingdom of Hawai'i. Again, an internationally illegal act at the time it was done. 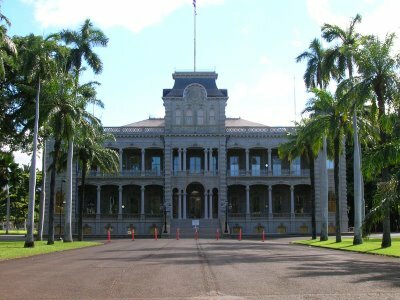 "Pursuant to the conspiracy naval representatives called armed forces of the United States to invade the sovereign Hawaiian nation on January 16, 1893, and to position themselves near the Hawaiian government buildings and the ['Iolani] Palace to intimidate the Queen [Liliuokalani] and her government." Notice the use of the word "invade." Today we like to use euphemisms such as "incursion," right? That's another word for invasion. But here they call an invasion an invasion, right? That's what it was, a clearly illegal act, an invasion in violation of treaties and international agreement, an invasion in violation of international law, and the United States Constitution, the overthrow of a lawful government. And again, under international law when you have a violation of treaties of this magnitude, the World Court has ruled that the only appropriate remedy is restitution. Damages are not enough, reparations are not enough - that is the payment of money - or giving you an island over here and saying, "Here, you can have that island." No, restitution, to restore what you once had, that is the Kingdom of Hawai'i, your independent nation state, this is the appropriate remedy, if that is what you want, for what was done. Now it goes on from here, reciting the sorry history of what happened, the establishment of the provisional government. Well, that's not entitled to any legitimacy at all. It was imposed by raw, naked, brutal military force, at the point of a bayonet, gunboat diplomacy, by the United States Government just as was practiced in many other countries, only here now Congress is finally admitting this. And again, pointing out in the next paragraph, that the establishment of this provisional government was without the consent of the Native Hawaiian people or the lawful government of Hawai'i and violated all of the international treaties and agreements. So under international law, you would not call this a provisional government - I certainly wouldn't call it that - you would call it a government of military occupation. And certainly I would suggest that would be an appropriate way to think about it. That is, you had military forces here and then you had a civilian arm of the military occupying regime. You see the same thing today in the occupied Palestinian lands, where you have the Israeli occupying forces here and they have then set up a civilian arm of their military occupational authorities to administer the civil affairs of the Palestinian people. These matters by the way are currently the subject of the negotiations between the PLO and Israel today, about the withdrawal of (1) the civilian military occupation arm, and then (2) the military occupation forces themselves. And indeed the September 13 agreement signed by Arafat and Rabin calls for the dissolution of the civilian occupation arm and then the withdrawal of the military occupation forces themselves. So I submit that this "provisional government" is really the civilian arm of a military occupation force, and that then is the predecessor to the current government of Hawai'i that administers you today. Again, following the implications of the public law, that the state government of Hawai'i occupies a similar position. And then of course you have federal occupying military forces here keeping it in power. Again, somewhat similar to the arrangement you have in Palestinian lands. We then come to the very famous statement by your Queen. "That I yield to the superior force of the United States of America,"
and you are aware of the rest of the language. Well, she made it very clear here that this statement and her later abdication was procured under duress and force. In other words, it could not be treated by anyone as a valid surrender of sovereignty by the Native Hawaiian people at all. And she made that very clear in this language. So in other words she was simply bowing to superior power, but not as a matter of right or of law. And I've done a similar thing myself in the Bosnia case in the world court, where I pointed out in a file communicating with the World Court, that the so-called Owen-Stoltenberg plan to partition the Republic of Bosnia and Herzegovina, was concluded, or arguably still might be concluded, by means of threats and duress, compulsion and coercion, and therefore was invalid, would be invalid, under international law, and the Vienna Convention on the Law of Treaties. This type of behavior still goes on today. But your Queen, a very powerful person, made that clear, that she was simply yielding to superior force, and thus preserving the rights of her people for the future, their right of self-determination, their right to restoration of their sovereignty. "Without the active support and intervention by the United States the insurrection would have failed for lack of popular support and insufficient arms." And I was reading this little letter by the fellow who traces his ancestry back to one of the missionaries who pulled this thing off [Thurston Twigg-Smith] saying: Well, in saying you know, we should stop all this debate, these are real genuine patriots, et cetera, et cetera, and of course they were entitled to do what they did. Well, apparently he didn't bother to read the law. Okay, he can say whatever he wants, but Congress has now made it very clear what happened. And he can argue till the cows come home but this is now the law. He'd better read it. And in fact Congress has condemned what his ancestors had done. And now the simple question is: Where do the Native Hawaiian people want to go from here? "The U.S. Minister raised the flag and declared Hawai'i to be a protectorate of the United States." Well, of course that's nonsense. They didn't protect anything, did they? There was no need to protect Hawai'i, what, from itself, from its own people? Who was threatening Hawai'i at that time? It was the United States. They needed protection from the United States, so this is absurd. It's entitled to no legal validity at all at the time, or even now, and that's basically what Congress is saying. "Military representatives had abused their authority and were responsible for the change in government." Again, they admit that, that they acted illegally under international law. But an admission is not enough. The implication, then, of these admissions, by Congress, by the Blount Committee, is that there must be restitution. The Hawaiian people have a right to be returned to the situation they were in, as of January 17, 1893. This is their right if that's what they want. They disciplined the Minister and forced him to resign his commission. Well, they should have done that, of course they should have, but that should not have been the end of the process. The overthrow should have been reversed. They had the authority to do it, the President could have done it if he had wanted to, he just didn't do it. So this is simply eye washing. It's nice that they finally conceded these points, but it's not enough under international law. Now I don't know how the Native Hawaiians feel about it. I suspect maybe they'd agree with me that it's certainly not enough. Where it should lead from here you know is another issue. Again I'm trying to point out line by line that this resolution clears up all these matters, all debate, all argument, and it makes it very clear you have a right of restoration, of restitution, to proclaim your state. And you don't need the permission of Congress to do this. Congress might not like it, but they're kind of stuck with their own law, are they not? "An act of war, committed with the participation of a diplomatic representative of the United States and without authority of Congress." Clearly admitting that this was illegal behavior of the most heinous type. "A substantial wrong was done," calling for the restoration of the Hawaiian monarchy. Now of course that wasn't done, but that doesn't change the legal situation. Today, a hundred years later, you have a right to restore it yourselves, if that's what you want to do. You don't need to petition Congress to do it. Congress has given you everything you need right here to do it, if that's what you want to do. And the United Nations Charter provides the rest of the authority to do it. Now, again I won't go through all of the paragraphs here because I take it all of you have read it. The Newlands Joint Resolution provided for the annexation of Hawai'i. Where's the authority for this? None. They stole the land, invaded the country, displaced the government, and now they annex it. This issue was addressed by the Nuremberg Tribunal in 1945, where the Nazi government tried to maintain that some of the annexations of foreign territory that it had undertaken before and during the Second World War were entitled to legal recognition. The Nuremberg Tribunal itself in 1945 said, "No, annexations are invalid, prior to the conclusion of a peace treaty." The United States government and the President conceded they've engaged in acts of war, they're occupying, they put themselves at war with your people. Now they've annexed it, but the annexation has no validity under international law. If as part of the peace treaty between Hawai'i and the United States you want to concede them some land that's up to you, that's your choice. Or if you want to give them operating facilities for a base upon the payment of funds and rent or something, that's for you to decide, but now they have effectively in this law invalidated the entire annexation. The whole legal basis for it has now been invalidated. And I was pointing this out to Judge Nakea this afternoon. If the annexation of the land is invalid, then where does the title come from, who has title to the land? It's the Native Hawaiian people who retain title to the lands of Hawai'i, as a matter of international law. Not the federal government, not the state government, but the people themselves. That's the implication here, certainly as I read this section, as an international lawyer. And again these finding of fact and conclusions of law are now officially set forth by Congress, so it's only one step, as I'm trying to point out here. What are the implications then of these findings of fact and conclusions of law? Certainly as I see it, I'm trying to spell out line by line what the implications are. "The Newlands Resolution, the Republic of Hawai'i ceded sovereignty over the Hawaiian Islands to the United States." But again the Republic of Hawai'i never had sovereignty over the Hawaiian Islands. We've already determined that the so-called Republic of Hawai'i was the civilian occupying arm of a military occupation authority. It had no sovereignty. Military occupation forces, even though they are there and are present, do not exercise sovereignty over the territories they occupy. Sovereignty remains in the hands of the displaced sovereign. This is black letter international law. This is the issue at stake in the Middle East peace negotiations between the Israelis and Palestinians. The Israelis do not have sovereignty over the West Bank, the Gaza strip, and East Jerusalem. They're a military occupation authority. They exercise administrative powers, but they do not have sovereignty. They never had. The sovereignty remains in the hands of the Palestinian people, and they have proclaimed a state. Again I submit there is a parallel here for Native Hawaiian people. Sovereignty resides in your hands. And this so-called Republic never had sovereignty to cede to the United States, and that's pretty clear just reading through the resolution and moving one step forward from the analysis set forth here. "The Republic of Hawai'i also ceded 1,800,000 acres of crown, government, and public lands of the Kingdom of Hawai'i, without the consent or compensation of the Native Hawaiian people, or their sovereign government." Once again, they had no authority to do this, for the reasons I've already spelled out here. The government of the Republic of Hawai'i was a military occupation authority, the civilian arm, without any sovereign claims to the land under the laws of military occupation, the laws of war. There was nothing to cede, they had no power to cede anything. And the title then, to the land, rested and still rests, under international law, with the Native Hawaiian people. Again I was trying to point this out this afternoon to Judge Nakea. How can it be said that the Graces trespassed on their own land? You can't trespass on your own land. And the trespassers then become the State of Hawai'i, and the land developers, and the golf courses, and the resorts. So what this statute does is point out that the whole situation is completely turned around on its head. It now changes the whole way certainly that these authorities should be looking at the matter. They're the trespassers and the criminals. You are simply the Native Hawaiians asserting your rights under international law. And now this arrangement, as it were, this reversal of positions, between who is the criminal and who is the victim, who is asserting their rights and who is violating their rights, has been effectively conceded by Congress. "Everyone has the right to a standard of living adequate for the health and well-being of themselves and their family, including food, clothing, housing, medical care and necessary social services." "Everyone has the right to freedom of thought, conscience, and religion. This right includes freedom to manifest his religion or belief in teaching, practice, worship, and observance." So where is the right of the State of Hawai'i, or a real estate developer, or a resort developer, to destroy any of your temples, when these are your temples, this is your land, your right to worship is guaranteed in the Universal Declaration. I don't see that right any more, and indeed it will be very hard for them to argue that right now that this law has been passed. I won't go through the applicability of all the Universal Declaration of Human Rights to the activities of Native Hawaiians here in relations of state and federal governments. Again I'd encourage you to get this from Amnesty International. They have them available. Read through it, and understand what your rights are, and proceed to assert them in your dealings with the state and federal government. "Whereas, the Congress annexed Hawai'i and vested title to lands in Hawai'i in the United States." Clearly illegal. We've already seen it. The annexation was invalid. 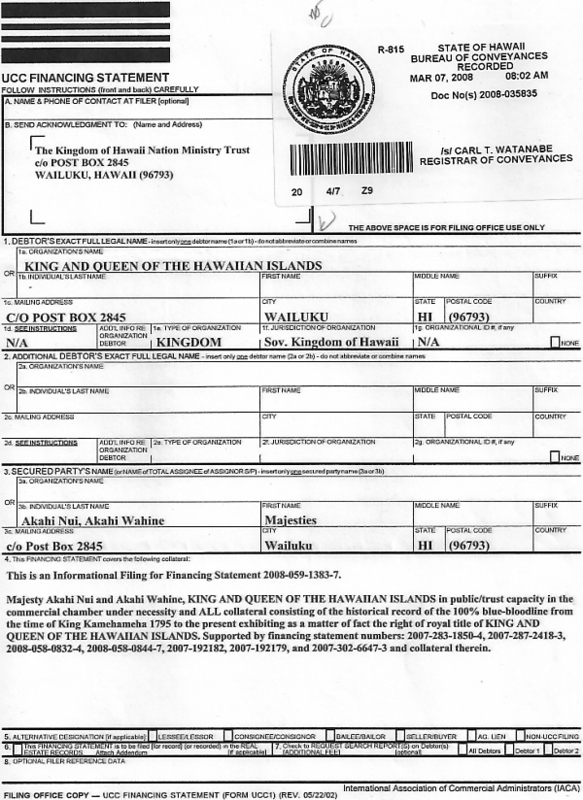 You can't get title from the Republic of Hawai'i because they never had title in the first place. They had no sovereignty. They were nothing more than a military occupation power, and a military occupation power cannot validly transfer title to land. Again, black letter international law. That is why today the United States government condemns the settlements in occupied Palestinian land. Settlements are illegal. You can't transfer title, the occupying power can't sell land legally. I mean they can do it, but that doesn't make it lawful. It's invalid. It is illegal. So an occupying power can't sell land, they don't control title or sovereignty. They can administer, but that's all, arguably, they can do. In theory, they're obliged to leave, not to stay. "Whereas, the Newlands Resolution effected the transaction between the Republic of Hawai'i and the United States government." Again, it's entitled to no validity at all, since it's based on an illegal invasion, violation of treaties, violation of principle of pacta sunt servanda. We could be here all night discussing violations of law that accrued as a result of this. "The indigenous Hawaiian people never directly relinquished their claims to inherent sovereignty through a plebiscite or a referendum." This gets back to the question of what happened, back in, what '59, right? What validity was that entitled to? Well now Congress is saying: None. And I would say even before this, none, because you didn't have a plebiscite conducted by the United Nations organization itself, which would have been a requirement if Article 73 of the UN Charter had been carried out. The U.S. didn't do that. So Congress is effectively conceding now that the so called vote is meaningless, as a matter of international law and United States domestic law. So you're not bound by it. Rather I'm suggesting you're now free to determine your own fate pursuant to the principle of self-determination in Article 1, paragraph 2 of the United Nations Charter. Let me skip down. Again, I don't want to go through all this, take up all your time. "Whereas, the long-range economic and social changes in Hawai'i over the nineteenth and early twentieth centuries have been devastating to the population and to the health and well-being of the Hawaiian people." Well that's an understatement. The Hawaiian people have been subjected to the international crime of genocide, as determined and defined by the 1948 Genocide Convention, and the 1987 Genocide Convention Implementation Act, the Proxmire Resolution. That is clear. That was one of the findings of the San Francisco Tribunal. That was one of the key findings of the tribunal held here this summer concerning Hawai'i [Ka Ho'okolokolonui Kanaka Maoli]. And I submit, having argued genocide myself to the International Court of Justice, and having convinced them that genocide is going on in Bosnia-Herzegovina, I personally would have no difficulty at all in convincing the World Court that genocide has been practiced by the United States government against native Hawaiians. Now, that's bad enough, but where does that lead you? I submit where it leads you is back to the creation of a State. One of the few and only protections a people have from being exterminated by means of genocide, is their own state and ultimately United Nations membership. This is what happened to the Jews - right? - from 1939 to 1945. They did not have a state. They did not have membership in the League of Nations. So everyone looked the other way and they were exterminated and wiped out. Today the situation is being replayed in respect to the Bosnians. The Bosnians do have a state and they do have U.N. membership and it is the one thing they have that is keeping them from going the same way as the Jews. And the Palestinians recognize this, too. That they had to proclaim a state, in order to protect themselves from be being annihilated. So a state, an independent sovereign nation state is one way a people who are threatened with extermination by means of genocide can attempt to protect themselves. And according to the statistics that Kekuni Blaisdell presented to the San Francisco Tribunal that native Hawaiian people are threatened with extinction by the year 2030. So this is something that has to be given very serious consideration. What is the best way to protect the existence of your people, as a people? Is it to accept the same status as Native Americans, which I guess Secretary Babbitt is considering graciously giving you? Or is it to proclaim your own state, and then ultimately seek international recognition and finally U.N. membership? Again, this is for you to decide. You have to consider the alternatives because ultimately it's your future and that of your children and your children's children that is at stake. "It is proper and timely for Congress to acknowledge the historic significance of the illegal overthrow." Before then they only talked about an overthrow, they didn't concede it was illegal, although it violated all these treaties, but now they say it is illegal. So in other words, they're agreeing with what I'm telling you. It was illegal. If you had any doubt, now even Congress is agreeing. It was an illegal overthrow. It had no validity at all. The fruits of this overthrow are entitled to no recognition as being valid today. And that calls into question title to all the land here. Who's land is it? Well, from what congress seems to be saying to me its the land of the Native Hawaiian people. Then they talk about reconciliation efforts, support the reconciliation efforts. Well, of course I'm in favor of reconciliation. But there's more to it than that. Again, under international law, if you have a violation of this nature the appropriate remedy is not simply reconciliation, apology or reparations, but restitution. That is, to set right the harm that had been done. To restore the situation to what it had been before the violation in 1893. And there is a very famous case by the World Court, the Chorzow Factory case, would be the authority for this. So in other words, sure, have reconciliation. But what about restoration? That clearly is what you're entitled to. Now we get to this Section 1, Acknowledgment and Apology. Again, they repeat, "Illegal overthrow," so it's not simply me interpreting the significance of the various whereas clauses, but now in the operative provision of the statute: resolved by the Senate and House of Representatives of the United States of America, in Congress and Senate, and signed by the President. This was an illegal overthrow. Acknowledges the historical significance of this event which was ultimately the suppression of the inherent sovereignty." So notice what they're saying. The Native Hawaiian people still have sovereignty. The sovereignty inheres in you. And now it is for you to decide what to do with this sovereignty. Because the state of Hawai'i, the federal government, are as I said, the civilian arms of the military occupation authority. And military occupation authority do not have sovereign powers. The sovereignty resides in the people. And that is clearly the implication of Section 1 of the operative provision of the statute. Paragraph 3 apologizes for the overthrow, "With the participation of agents of the United States." Again, if you had any doubt about what I was telling you before, about the U.S. government being responsible for the actions of its ministers, they've now called these people "agents." So their conduct, their illegal conduct, binds the United States government, which means the United States government then, is under an obligation to undo the harm that was done. But even if they don't, the Native Hawaiian people have a right to act to undo that harm. And again if you doubt about that, the rest of the sentence says, "The deprivation of the rights of Native Hawaiians to self-determination..." So in other words, Congress has conceded that the Native Hawaiian people have a right to self-determination. What does that right include? Well, as I said, self- determination of peoples under the U.N. Charter reads, a right to a state of your own and to membership ultimately someday in the United Nations organization, just like the 188 other states that are currently members of the United Nations today. [Section] 4 expresses its commitment to acknowledge the ramifications. What are the ramifications? Well, that is the subject of my discussion tonight. If you followed the analysis that I presented before, then I put forward here what I believe are the ramifications, the implications, of the overthrow of the Kingdom of Hawai'i. Now, whether that's the direction you want to go, that is up to you, for you to decide, not me. "Any individual who is a descendant of the aboriginal people, prior to 1778, occupied and exercised sovereignty, in the area that now constitutes the state of Hawai'i." Again, affirming that the native people of Hawai'i were and by implication still are the sovereign authority in these lands, not the state, not the federal government, but the Native Hawaiian people themselves. Well, based then on this public law, and going through it line by line, I would express the opinion that today the Kanaka Maoli have the right exercise self-determination as a people in accordance with the U.N. Charter, and proclaim an independent state, if that is your desire. And, join the world community of states as an independent nation state. This also means that you have the right to determine your political status, your type of governmental organization to govern yourselves through customary systems. And freely pursue your economic, social, cultural development in accordance with Article I of the International Covenant on Civil and Political Rights and the International Covenant on Economic, Social and Cultural Rights. The United States government is party to that first treaty. That treaty also recognizes the right of Native Hawaiians to freely dispose of your natural wealth and resources, without prejudice to obligations arising out of international economic cooperation. This is your land. These are your natural resources. Whatever powers are exercised by the state and federal government are those of a colonial occupation military regime. But the sovereignty still resides in the hands of the Native Hawaiian people. You have the territory necessary for a state. The Hawaiian Archipelago, the lands that you had before the invasion of 1893. You would be entitled to claim a 12 mile territorial sea and a 200 mile exclusive economic zone, in accordance with customary international law and the Law of the Sea Treaty of 1982. The second requirement of an independent state are the people. And, again Congress has recognized the Kanaka Maoli people are a group of people with sovereignty, sovereign powers. You have lived here forever. You are the original inhabitants and occupants of these islands. You have always been in possession of your land. And so you would be entitled to reestablish an independent sovereign nation state in that land. Possession is nine tenths of the law. You're still here, you're still living in your homes, you are still occupying your land. And it might be true that the state and federal governments are illegally dispossessing you. But you are still going back in there, you're still building settlements, you're still occupying it, and your staying there. And that's all that international law requires, and as I have suggested, that certainly is your right under the Universal Declaration of Human Rights. Who would be your citizens? Well certainly the citizens would be those who are descendants of the Kanaka Maoli, who occupied and exercised sovereignty in Hawaii, prior to the Europeans in 1778. You would trace your ancestors back. Again, it would be your right to determine who your citizens are. I take it you would reject this blood percentage that has been set up by the United States government. This is reminiscent of Nazi laws, that were applied to decide who was Aryan. And those laws in turn were patterned on laws in the American South, on miscegenation, who was a black and who was a white. The way this is normally done by most states today, a state is free to determine who its own citizens are. And certainly you would be free to determine that all those who could trace their ancestors back to 1778 would automatically become citizens of the new state. Now, what about those who are living here who are not able to trace their ancestors back? What about them? Again this is an issue that has confronted several states today. For example, in the Baltics, Lithuania, Latvia and Estonia, where you have large number of Russian citizens left behind as a result of the Russian Soviet occupation for the last 50 years, which is about half the amount of time you're dealing with. And the Baltic states, the three of them have taken different approaches. For a period of time I advised the Republic of Lithuania under President Landsbeagis, who was the hero and leader of their independence movement, who lost an election and the people voted the communists back in, so I no longer advise them. But they've taken a very generous approach to those Russians who remain, trying to integrate them into their society. 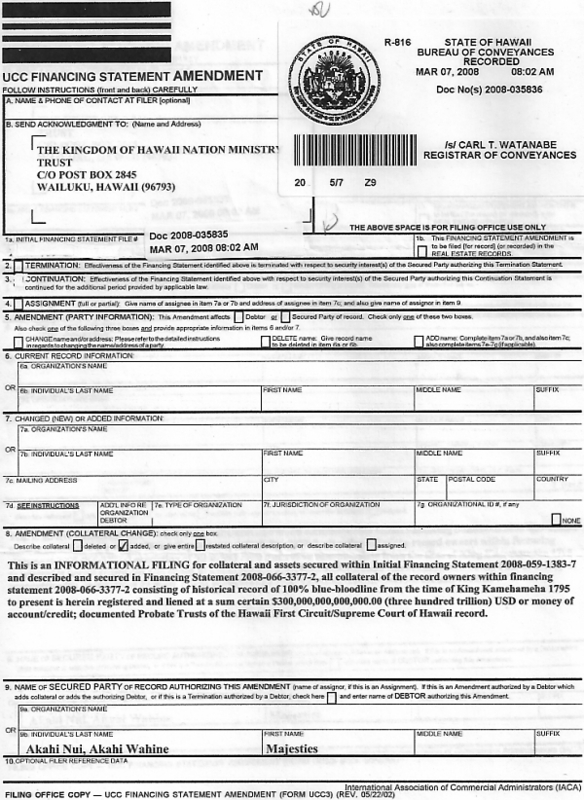 And certainly the Hawaiian state could the position that you'll set up a procedure to provide citizenship to all people who are habitual residents of the new state of Hawai'i as of a certain date, which would mean those who have lived here continuously five years, ten years, whatever cut off point you want, two years, are also themselves entitled to become citizens of this state on a level of equality with everyone else, but they have to apply for it. It would not be automatic, as would be the case with the Native Hawaiians, who would automatically become citizens. And again there are precedents here in the way the Palestinians are dealing with this. They too have a diaspora population. You have large numbers of Hawaiians all over the world who had to leave. Approaching it this way would enable you to allow all them too to claim Hawaiian citizenship, if that is the case, if that's what they want to do, and to return. The Palestinians did it that way. They set up a state and said: We're setting up a state for all Palestinians everywhere in the world. So in theory those who want to be citizens of the state can claim it and be admitted. There is also the situation that you have a large number of Jewish settlers living in occupied Palestine. And the Palestinians have taken the position that they are prepared to accept a certain number of Jewish settlers as citizens living in their state on a basis of equality with everyone else, provided that they are prepared to be peaceful and law abiding and to be treated as equals. So there are precedents for the new state of Hawai'i to take a similar position for those non-native Hawaiians who live here, and saying: We don't want you to leave. We're setting up an inclusive state. We want you to stay. And you would simply have to apply for citizenship in the new state. It could be done in a way that they would not have to renounce their U.S. citizenship if that's what the Native Hawaiians decide. That could be a big issue for the current generation of non-native Hawaiians living here. It probably would not be a big issue for the next generation. They would be Hawaiian at birth, entitled to citizenship at birth, and probably whether they would claim U.S. citizenship wouldn't be all that important. But for those who are here who are U.S. citizens it would be possible to allow for them to become dual nationals. That is they would apply for Hawaiian citizenship without having to give up U.S. citizenship. And this would be fully consistent with United States law. I was born in the United States, but I applied for Irish citizenship. My family's Irish, and I have Irish citizenship and an Irish passport. The Irish have been subjected to genocide, too. We know what it's all about. We are a diaspora people, too. We have people all over the world. And so we have an inclusive form of citizenship that allows people to claim it without having to give up whatever other citizenship they have as well. And the Native Hawaiian state could approach the question of citizenship in a similar way. A highly organized, self-sufficient, social system based on communal land tenure, maintaining order through mediation." That's all you need, and you have that. So you would simply work that out, the implications of that system on a state basis, that is the new Hawaiian state's basis. That would be the way the new Hawaiian state would be governed, not the current situation as you see it today. And finally the capacity to enter into international relations. And again here, I think that if you were to declare an independent state you would probably obtain recognition in that capacity from a fairly large number of states. I could not predict the number of states that would recognize you. I don't know. You would have the same problems in the equation of the Palestinian state. We didn't know how many states would recognize the Palestinian state back in August of 1988, before it was created. But here it is December of 1993, and there are 125 states that recognize the state of Palestine. And someday hopefully the state of Israel will recognize the state of Palestine. The state of Palestine already recognizes the state of Israel, and you can have peace and reconciliation between those two people as well. So I could not predict how long this would take, what would be the consequences, how many states will recognize you, but I take it that the plight of the Hawaiian people is generally well known in the world, and there's a great deal sympathy. For a variety of reasons the Palestinians have had an uphill struggle and battle in obtaining that recognition. So it might be that you would be able to obtain recognition quickly. And especially if you pursue this process in accordance with principles of peaceful, non-violent struggle. And I submit that's the most effective technique you have today. And if you doubt me, you should read Gandhi's book, Satyagraha, Non-Violent Civil Resistance. It's about 300 pages long. And it explains how Gandhi threw the mighty British Empire out of India without using force. People power, what we call it today. And I submit that the Native Hawaiian people would be able to do the same thing, moving in this direction and adopting the techniques of peaceful, non-violent action, which is what Gandhi called for. Well, those conclude the comments, the formal comments I had to make this evening. Again, this is presented not as a solution to any problems. My assignment here tonight as I understood it was to sketch, briefly, one outline, one alternative, that the Native Hawaiian people can consider, among other alternatives that are available to you. Obviously you could tell by some of the comments I've made, that I had some problems with a few of the other alternatives that have been presented to you, but ultimately it is your choice to make, not the choice of the United States Congress, not the choice of the State of Hawai'i, and with all due respect to the commissioners here. But it is the choice of the Native Hawaiian people. They have the right to self-determination, they have the inherent sovereignty, and that fact has now even been recognized by the United States Congress itself. So it's no longer just me up here as a law professor giving you an opinion as a law professor. But rather the opinion I'm giving you tonight is based up these formal findings of fact and law by the United States Congress.